Eschenbach, Lang Lang and the SHFO Give Austin a Show to Remember! There is no one hotter in the world of classical music today than Chinese pianist Lang Lang. 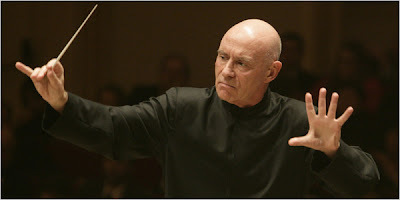 What a coup for Maestro Christoph Eschenbach and the Schleswig-Holstein Festival Orchestra (SHFO) that he agreed to be the featured soloist on their first North American tour! In this extraordinarily long tour of twenty-three concerts in thirty-two days, Lang Lang played concertos by Prokofiev, Mozart and Beethoven, with Eschenbach at the podium. I caught up with this remarkable road show at the Long Center in Austin, Texas. The Schleswig-Holstein Music Festival is based in Salzau Castle, 100 kilometers north of Hamburg, Germany. Over the past thirty years it has grown into one of the most prestigious festivals in Europe. Each year, a new festival youth orchestra is created after months of international auditions. One hundred young musicians are selected from over a thousand applicants around the world, and these fortunate 100 spend the summer in Salzau working with some of the world’s greatest conductors. Leonard Bernstein founded the Orchestral Academy of the Schleswig-Holstein Music Festival, and his work has been carried on by conductors of the stature of Valery Gergiev, Kurt Masur, Sir Georg Solti and Christoph Eschenbach. Fabulous - Fast and Furious - Clearly The Best of the Best! The SHFO Austin concert opened with Prokofiev’s Symphony No. 1 “Classical,” played with great precision and panache. I particularly liked the way Eschenbach shaped the brief Gavotta, reminding us that Prokofiev was, after all, a great ballet composer. The Finale went like the wind, showing off the orchestra’s virtuosic winds to great advantage. Attentive listeners might have noticed a quote from Beethoven’s Seventh in this symphony – an example of Prokofiev’s ‘affectionate parody’ of classical style. Lang Lang continues to astound audiences the world over with his incredible technique, but lately he is giving audiences much more – a deepening musicianship. He has gone out of his way, for example, to enrich his study of Bach and Beethoven with Daniel Barenboim, and of Mozart and Schubert with Eschenbach – each of these maestros an internationally acclaimed piano virtuoso in his own right. On this night, Lang Lang collaborated with Eschenbach on Mozart’s Piano Concerto No. 17 in G major K. 453. There is room for virtuosity here – Mozart, like Lang Lang, enjoyed showmanship – but the higher musical values required are beauty of tone and maturity of phrasing, and in this performance, Lang Lang demonstrated that he can play Mozart as well as he plays Tchaikovsky and Rachmaninov. The rapport between pianist, conductor and orchestra was remarkable. The give and take was exemplary from beginning to end. As Only Lang Lang Can! For his encore, Lang Lang chose the thrilling finale from Prokofiev’s Piano Sonata No. 7. He played with incredible abandon and the kind of bravura that is nearly unique today. This evening’s performance of Beethoven’s Seventh Symphony opened with an unusual ‘delayed’ first chord; this was quite deliberate on Maestro Eschenbach’s part, but at least one critic reviewing an earlier performance on this tour complained about a lack of unanimity in the orchestra. In fact, Eschenbach was employing a style of attack considered the norm when Furtwängler and Böhm were conducting. German orchestras were trained to play the first chord in classical works after, rather than on, the conductor’s downbeat, the goal being that the musicians should feel the first chord together, and enter accordingly. With orchestras trained in this tradition, this tactic works quite well - as it did in Austin. Eschenbach’s approach throughout the symphony was traditional rather than, as is ‘fashionable’ today, an emulation of the style advocated by the period instrument specialists. There was lots of vibrato in this performance and tempi were moderate rather than fast to the point of unintelligibility. The timpani were forceful, but not intrusive as they so often are in period instrument performances. The performance had plenty of excitement, as Eschenbach whipped up his players in all the right places. If you are interested in hearing the Schleswig-Holstein Festival Orchestra on its home turf, plan to be in North Germany this summer between July 10 and August 29. The festival will be celebrating its 25th anniversary, and the theme this year is the music of Poland. Among the guest artists will be Valery Gergiev, Alan Gilbert, Christopher Hogwood, Thomas Hampson and Matthias Goerne. There will be 136 concerts during the seven-week festival, and the concerts will be given in 74 different locations in the Schleswig-Holstein region. For more information visit the festival website. With the spring opera season in full swing, the musical offerings are varied and delectable. Top on my list is the opening of one of Donizetti's "Three Queens" - Maria Stuarda, at the Canadian Opera Company. This is the first fully staged production of this opera in Canada. 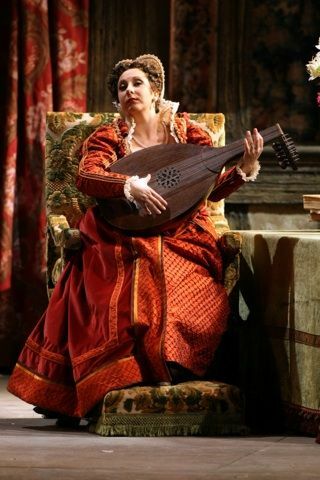 It has a really great cast, headed by Italian soprano Serena Farnocchia in the title role. She was Luisa Miller for the COC, impressing everyone with her limpid, gleaming tone. She is also a wonderful Liu and Mimi, the last I heard her sing in Santa Fe in 2007. I look forward to her return. Also very special is the appearance of Bulgarian soprano Alexandrina Pendatchanska as Elisabetta. Saw her in Ermione and as Vitellia in La Clemenza di Tito at Santa Fe some years ago. I was bowled over by her intensity and "take-no-prisoners" style of vocalism - a very exciting singer. Tenor Eric Cutler makes his company debut as Leicester. Antony Walker conducts. Opening night is May 1, and it promises to be an evening of vocal fireworks - not to be missed! In the mean time, the COC production of Der fliegende Hollander continues with performances on Wednesday April 28 and Sunday May 2. As well, Opera Atelier's English language The Marriage of Figaro will be at the Elgin Theatre on April 27, 28, 30, and May 1. I attended opening night and enjoyed the handsome production, clever staging and the fine ensemble singing. I am usually not one for operas sung in translation, but this very clever English translation worked well. This is a show well worth attending. The Toronto Symphony Orchestra is presenting Mendelssohn and Mahler, a rather eclectic and unusual pairing, on Thursday 8 pm (repeated on Saturday May 1) at Roy Thomson Hall. On the program is Mendelssohn piano concerto No. 1 with pianist Anton Kuerti, and Mahler Symphony No. 7. Peter Oundjian conducts. On Saturday 1 pm at selected Cineplex cinemas across Canada, the Met in HD is presenting Rossini's Armida starring American prima donna Renee Fleming. The Met mounts this production as a vehicle for Fleming. This is is hardly ever done, not just because it is so long - four hours, but also it requires five tenors! The Met has high tenors Lawrence Brownlee, Bruce Ford, and Barry Banks, so there won't be any shortage of stratospheric notes! I don't know about the ticket situation, but you might want to call the Cineplex theatres carrying the show. The encore performance will be on May 22. Also on Saturday, Chinese pianist Yuja Wang is giving a recital of Schumann, Schubert, Liszt, Scriabin, and Prokofiev at 8 pm in the new Koerner Hall. Wang is now on the roster of Deutsche Grammophon and she is definitely a pianist to watch. The Aldeburgh Connection presents a very intriguing concert on Sunday at 2:30 pm at Walter Hall. It is billed as City of Villages, a singer's tour of Toronto, with works by Wagner, Sullivan, Beckwith and Ross. The soloists are soprano Lucia Cesaroni, mezzo Allyson McHardy, tenor Lawrence Wiliford, and baritone Benjamin Covey. Stephen Ralls and Bruce Ubukata will be at the piano as usual.